We know the story: Cain killed his brother Abel. God addressed Cain: Where is your brother? Cain shrugged, Am I my brother’s keeper? When confronted with his sin of fratricide, Cain’s dodge was to claim he didn’t know it was his job to look after the man he killed. According to a lecture given by Cardinal Peter Turkson at the Saint Louis Climate Summit last month, the word Cain uses for keeper has the same Hebrew root as the word often translated care for or keep in God’s intention for Adam and Eve in the garden: “to cultivate and care for it.” The answer to Cain’s dodge is that, yes, he is his brother’s keeper. And not only are we our brothers’ and sisters’ keepers, we’re the earth’s keepers, too. What first struck me when I saw Cardinal Turkson in person is the man’s joy and humility. He is on the verge of a smile each time he opens his mouth to speak. His Eminence presented two lectures to the various scientists, religious leaders and concerned members of the public who had gathered on the Saint Louis University campus to compare notes on the ethics of climate change. The event, which received a papal blessing, brought together people of all faiths and no faith. Yet, the distinct mark of Catholic teaching was a pervasive theme. 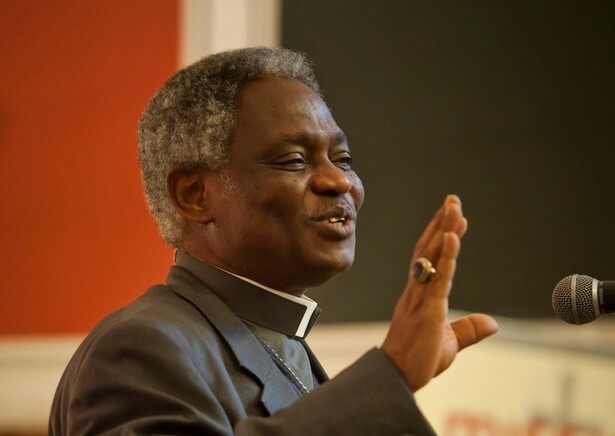 Against a strain of environmentalism which calls for population control, Cardinal Turkson insisted that if we treat creation responsibly, we can trust it to support the entire human family. Indeed, the very purpose of creation is to support human life. The next day Dr. Prabhu Pingali, a Cornell economist, pointed out that innovation and changed lifestyles have proved neo-Malthusianism wrong in the past and can do so again. All of that, however, will depend on us. So often we resort to Cain’s dodge: Am I my planet’s keeper? Is this really my responsibility? Isn’t fixing a disrupted climate and battered ecosystems someone else’s job? But at a time when the United States government has begun backing out of the international effort to care for the garden that God has entrusted to us, American Catholics have an opportunity to take on the responsibility ourselves. We are our planet’s keepers. Follow this link to discover how to involve your community in the Catholics Are Still In campaign.